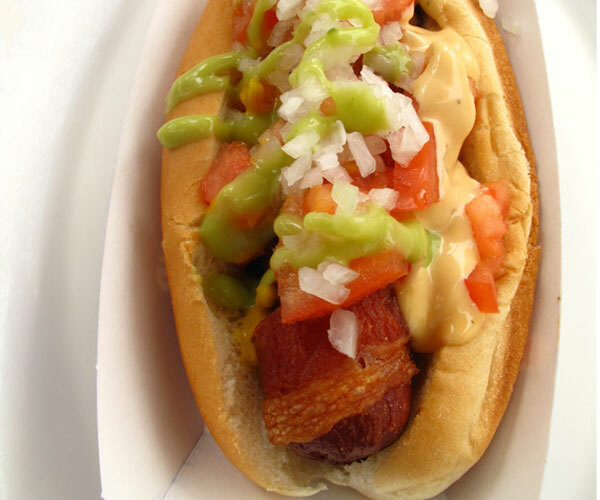 At Monterrey-style Mexican restaurants these are made with fat red hot dogs and are called salchichas rojos. In Tucson, they are called Sonoran hot dogs. There are all sorts of variations, but the bacon-wrapped weiner is essential. Look for a small size bolillo or torpedo roll to keep the bread-to-meat ratio in line. For an easy summer BBQ menu, serve the dogs with Mexican Grilled Corn on the Cob. This recipe is excerpted from The Tex-Mex Grill and Backyard Barbacoa Cookbook. Put the cleaned tomatillos in a saucepan and cover with water. Bring to a boil, then turn off the heat and allow the tomatillos to soak for 5 minutes. Remove from the heat, drain, and puree the tomatillos in a food processor. Add the cilantro, serranos, onion, garlic sugar, and lime juice to the food processor and pulse three or four times to combine. Season with salt to taste. Mix the mayo, Tabasco, and lemon juice and use a funnel to put the mayo blend in a squeeze bottle. Wrap the wieners with the bacon slices so the sausage is completely covered. Cook the wieners on a comal or flat top, rolling them over until the bacon is crunchy on all sides, about 7 minutes. Cut a pocket into the buns to form a “boat” and toast them on the grill. When the wieners are cooked, divide the beans and avocado among the four rolls, spooning them inside the pocket and spreading on either side. Spread the cheese down the middle. Using tongs put one piping-hot bacon-wrapped wiener into the pocket of each roll. Top each wiener with onions and tomatoes. Spread the Salsa Verde across the top. Apply the mayo blend in squiggles across the top of the hot dog. Love the dish! Easy yet very tasty, in fact, I made it for our dinner last night and it turned well. Thanks! Take a glimpse at fr.gourmandia.ca and www.ibeefrecipes.com for more admirable recipes!! You will be surprised of the different variations in their recipes. Thumbs up! The first time I had this was in Pennsylvania and they called it a Texas Tommy, healthy no, yummy yes.